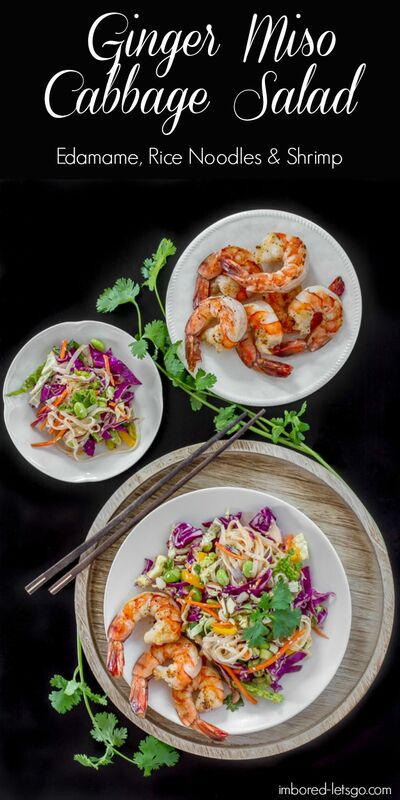 Ginger Miso Slaw with Edamame, Rice Noodles & Shrimp is a wonderful cabbage slaw salad loaded with goodies like edamame, carrots, bell peppers, rice noodles and topped off with grilled shrimp. The dressing is a little spicy and full of fantastic ginger miso flavor. I’m a big fan of cabbage slaw salads and you’ll find a few of them like my Asian Cabbage Salad or my Mexican Cabbage Salad here on the blog. Frequently I’ll make a big bowl during the week to have ready for lunch for a few days…cabbage holds up well when dressed. I recently made a simple, but oh so delicious ginger miso slaw. I loved it so much I wanted to expand on it for a main course meal. 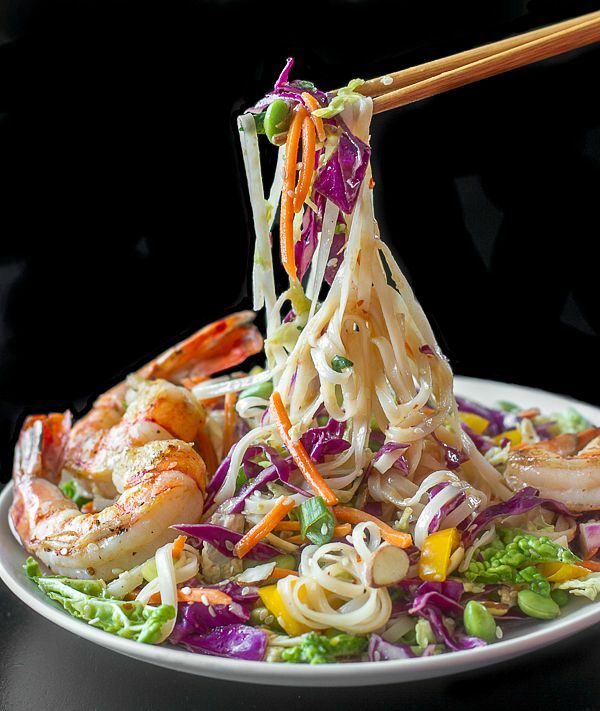 This time around I added edamame, cold rice noodles and grilled shrimp! Don’t like shrimp? Try some chicken! Or leave it out and keep it vegetarian. The ginger miso dressing is pretty much like all the other ginger miso dressings you’ve probably seen around town. Ginger, miso paste, rice vinegar, etc. I wanted to make it a little spicy so I added some garlic chile paste. You could use Sriracha if you wanted instead…or leave it out if you don’t like spice. Just because it’s September and everyone wants to start cooking fall comfort food (or everything pumpkin) doesn’t mean you shouldn’t eat salads anymore! 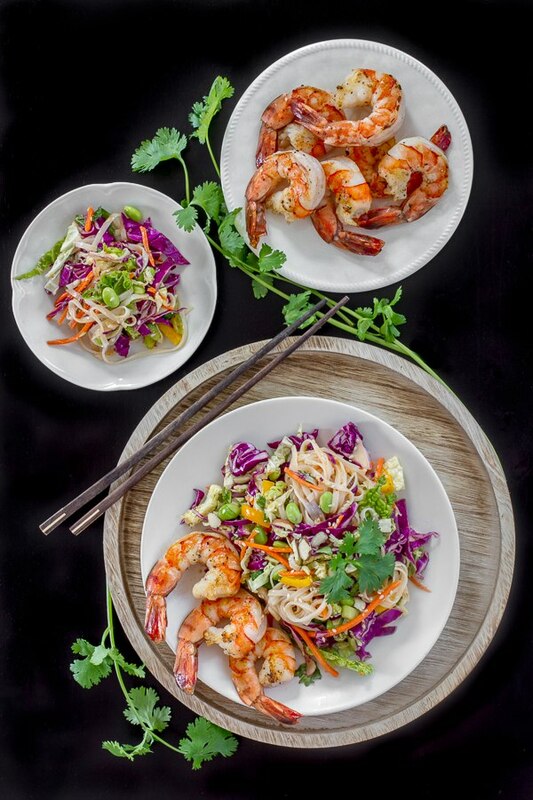 Hurry up and make this Miso Ginger Slaw with Edamame, Rice Noodles & Shrimp. You’re gonna love it! In large bowl, combine cabbage, green onions, carrots, bell pepper, and edamame, sesame seeds, nuts and herbs (if using). Toss well to combine. Add noodles to bowl with dressing and toss well (this helps them from sticking together). Then add noodles to slaw/salad and toss to combine well. I think clean hands work best for this task since the noodles are long and tend to easily clump together. Set aside in refrigerator while preparing the shrimp. Lightly toss shrimp with oil, salt & pepper, then grill on grill or grill pan (or you can roast them in the oven) until pink and slightly firm. This only takes a few minutes...don't overcook the shrimp or they'll get rubbery. Top each serving with some shrimp and enjoy! Catch up with me on FACEBOOK, PINTEREST, INSTAGRAM , TWITTER , or GOOGLE+ I’d love for you to follow along! Subscribe HERE and never miss a new recipe! This is gorgeous, and it sounds so good! This is my kind of salad! I love the almonds and fresh herbs in there, and that miso dressing sounds killer! I adore Asian inspired noodle dishes. I also happen to have some miso in the fridge that I need to use up. This is perfect. This is so bright and colourful and looks sooooooo delicious! My husband is a big miso lover and I think this will be his next favourite noodle dish! What a great combination. I’ve been in the mood for shrimp lately, so this sounds like a perfect lunch or dinner. Full plate overflowing with asian flavor yum!! Perfect slaw and noodles! Your pictures are beautiful and they’re making me so hungry! What a great lunch idea! That looks delicious!! Combining ginger and miso is a genius idea…and cabbage is one of my fave vegetables this time of the year!! This looks amazing! I love the ginger miso dressing. I agree, you shouldn’t stop eating salads just because it’s fall.